If a terrorist incident rendered your business premises inaccessible tomorrow how would your business continue to function? Mustard IT can help you with continuity planning to keep your business operating as well as disaster recovery solutions that restore your systems back to how they were prior to the incident. If you are running a nightly backup, ask yourself when was the last time it was tested? Mustard IT will perform sample restores for contracted support clients to ensure your critical files are there when you need them. We will also review your disaster recovery plan at regular intervals. Human error and hardware failure have always been good reasons to take regular backups and that means an automated routine with copies of your data being removed from site. 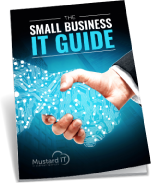 Mustard IT can recommend a variety of backup solutions depending on the needs of your business. We help customers to safeguard their data using media such as external hard drives or by streaming files to servers on remote sites. Our online backup service automates a nightly backup of your work to cloud-based servers from where a restore can be quickly arranged, should the need arise. In recent years, as reliance on IT systems has increased, businesses have grown more aware of the need for business continuity planning and disaster recovery solutions to help mitigate the risks posed by terrorism, natural disasters and other events which threaten to render a network completely inoperable. Whilst backup routines can form a part of your business continuity plan, other aspects of your operation also need to be examined such as hardware redundancy, secondary internet connections, the ability to divert incoming calls, remote working solutions and alternative premises from which your business may need to operate. Do you feel prepared for a catastrophic event such as major hardware failure, a natural disaster or office fire? Arrange a meeting with a Mustard consultant and begin planning the recovery of your business whilst time is still on your side.